A package arrived just in time for the HOTTEST day of the year thus far which just so happened to be the Green River Marathon day.. LUCKY ME!! 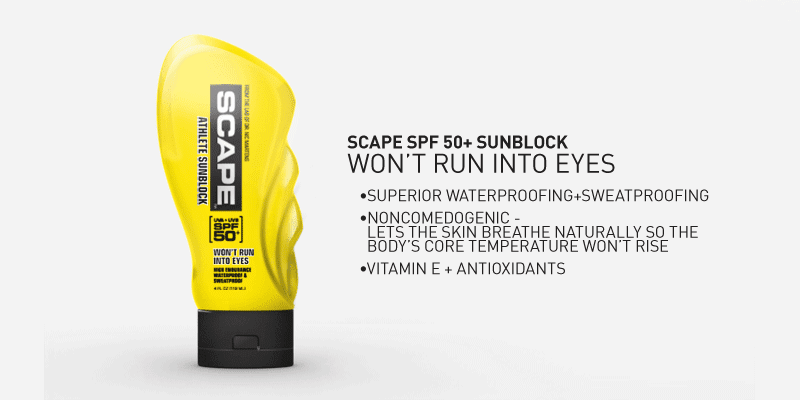 The wonderful folks at SCAPE HERE had sent me a package of sun care products to test. SPF 30 Athlete sunblock, they also have SPF 50. I generally do not test new lotions before a LONG run but the words "Waterproof and Sweat proof" convinced me to give it a go. First impression: No Scent!! This sunscreen goes on smooth with no odor. Once on my skin I did not notice the normal sunscreen film. I have sensitive skin, and this product did not cause irritation or itching. After 4 hours of running and sweating with hardly any shade I did not have a sunburn. This product passed the MARATHON test!! Face Stick. I did not realize that this was a face stick so I have not tested it yet. I am excited to try it out because lord knows that as runners we NEED to protect our faces. Lip Balm with SPF. I generally do not like lip balms with aloe because the taste is strange. This lip balm was GREAT! I put it on before the race and packed it in my pouch. It has no taste, goes on smooth and protected my lips from the sun. 1. Go to the SCAPE web page HERE and look around. Come back and leave me a comment about the web page, products or anything that catches your attention. 3. What do you do to protect your skin when you are running, swimming, biking, hiking, outdoors, etc.? Leave a comment. 4. Tall Mom 1,000+++ club members and those who have donated to Tall Mom Marathon for the Cure HERE, get a free entry. Leave a comment. Winner will be announced on my Birthday June 14th!! Stay tuned for more in the 500 POSTS WEEK of GIVEAWAYS!!! I'm usually most interested in the sprays, because they seem to go on the easiest. I love the fact that they are fragrance-free. I'll be sharing this giveaway on my weekly links post, which will post on Saturday. I'm interested int eh sunblock spray. I've heard they don't give as good as coverage, but I've never tried one. I have to admit I don't usually protect my skin. I'm terrible like that. I really should. When have skin cancer I'll really regret it. I like the "technology" page on the website. 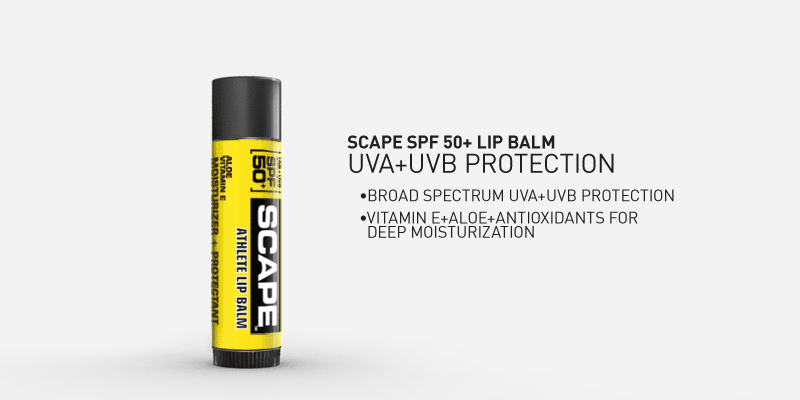 It's nice to see how Scape stacks up against other types of sunscreen. I always wear sunscreen. Right now I'm wearing Neutrogena and I love it! I need this so badly! I currently use an oil free sunscreen on my face but it DOES get in my eyes and STINGS, which I hate. Ouch!!! Checked out the website and I'm liking the spray! That would be so quick & easy! I have donated to the cause! I try to always wear sunscreen (safety first!). I switch between the spray suncress (easy to put on) or the Neutrogena (the only one that I find isn't greasy or oily). I saw their Clean Foam SPF and would be interested in seeing how that works too. Their website is very streamlined, I was excited to discover that they're based in Gardena, CA - that's very close to me! To protect my skin when I'm outdoors, the first thing I definitely do is put on sunscreen, and depending on the activity, wear a hat and sunglasses. I also try to avoid the peak sun hours and do activities either early in the morning or late afternoon/early evening. (My comment about their website won't win me this giveaway for sure.) Why are all the photos of guys???? Don't girls use sunscreen? I thought the sunblock spray looked good as well as the face stick. The foam applicator looks great too! I don't like to get it on the palms of my hands. To protect my skin I usually wear tops that cover and I always use lotion with sunscreen in it. I try to put on sun screen for all my runs. Problem; it runs in my eyes from my forehead...I wear my visor almost always and I wear it really low! Get ready for a super shout out on my blog...Day 30 post!!! I linked this giveaway up to my blog! I don't have a sun protection solution right now. When I am out walking with the family I have a big floppy hat and we are not out long but for running....I am looking for a good option. I do wear arm sleeves. I'm so excited to try SCAPE! The thing I love the most about it is that the developer is an endurance athlete himself so he is committed to making products that really work for those of us who train for hours out in the sun! Haven't won a giveaway yet - hope this is the one that changes my luck!!! I wear 30 or 50 spf sunscreen and try to also use the special stick kind on my face. I also always make sure to reapply when I transition between a bike ride and a run. Lastly, I find that if you put on the sunscreen at night before you go to bed then it has really soaked in by morning so that it doesn't sweat off as much on a morning run/ride/swim. the foam applicator sunscreen is intriguing. ughh, i hate to admit it but i dont wear sunscreen when running. most times i run when its still dark and i forget to put it on when i run when its light out. i really need to be better about it!!!! I use spray suncreen before I head outside when I'm exercising. I also use a face mouisterizer with an SPF in it daily. The fact that this stuff let's your skin breathe is neat. I hate how some subblocks make me feel like I'm overheating! I learned a new word. I can't pronounce it though! Their products are noncomedogenic which means they let your skin breathe and don't raise your core temp. Pretty cool. A face stick would be super handy! i also think the pre and post workout gels are neat! right now though...I'm running between 9pm-11pm. Its the only time I dont roast. Usually before running or going outdoors i will put sunscreen on to make sure I don't get burned because I burn really really easily! I also try to wear a hat to shield my face at the beach. i don't have a running hat - I have never tried that. Went to Scape and am most interested in the lip balm. Have donated to Marathon for the Cure. I always wear some form of chapstick all day, running or not. My new cheap favorite one is the Up and Up brand at Target! However, I would like to try the Scape lip balm too! I really liked the roll-on foam. I don't like having sunscreen all over my hands. I don't protect my skin now, but I know I should. Living in Louisiana, I get alot of sun from March through October. If I could find one that did not make me feel hot or sticky, I would definitely wear it! I think that i would like the spray. i hate rubbing stuff in and the lip balm. I am not very good at protecting my skin. as bad as it is i still like having a tan and I don't like the drippy feeling especially on my face, eyes etc...i am trying to get better. donated to race for the cure! I would love any of it to be honest, especially if it doesn't smell, but like the face stick and lipbalm. I try to remember sunscreen, but am failing miserably right now... so I'm going with coverage at the moment (hat/sleeves/...). It's still pretty cloudy/rainy here and I haven't really gotten out of my long-sleeve helly base layer yet. Scape Clean Foam? That looks pretty cool? I usually like sprays because they are wicked simple to apply, but a lot of the product is wasted in the air. Also thought the pre and post workout gel looked interesting too. I protect my skin by wearing a hat and eye protection (aka my bug windshield). When I know it's going to be sunny, I use sunscreen. But if it's warm, I can't layer...I'm a little heater! But of COURSE I'm a Tall Mom 1000+++ member, yo! Gave you some FB link love. I'd like to know what "Clean Foam" is. It doesn't go into a lot of detail about it on the website. I do like the fact that you used it and it didn't run into your eyes. I'm forever getting sunscreen in my eyes which is no fun when you're miles from home. I went to their site and the geek in me likes that they put some of their scientific information on-line. Also that Meg is on their press page! I put the giveaway up on my blog. Protecting my skin is important to me. I actually put sunscreen on when I get up in the morning. I reapply sunscreen before I go out and continue to put it on through the day. I also try to buy SPF clothing and hats to wear when I'm out in the sun. Boy, that is a great website! They totally have me sold on how nice and easy it is to keep your skin sunburn free! Thanks for the giveaway! I hope I win or I will have to go and actually buy some! I am not always good about protecting my skin when I go out - I'd say 80% of the time I spray the stuff on and the rest my lazy side caves in. I do always wear sunblock on my face and lips, but my legs and arms and chest are tanned already and it's only the beginning of June! I'm a tall mom member and donater! Thanks again for the giveaway - this is one I really, really, really, really want! I think the face stick is cool, looks very easy to apply. I'm in the 1,000 club, and I donated to the Marathon for the Cure! I always wear a hat, sunglasses and sunscreen. Always. I've heard great things about this sunscreen. One thing I would like them to have on their website is the ingredient list. With so many sunscreens having cancer causing chemicals, it would be nice to know what is in this! I always wear sunscreen when I go out for a run, bike ride, or hike. I also wear my visor when I'm running to protect my face even more. The pre/post workout gels look interesting. I wear sunscreen and a hat to protect my skin. 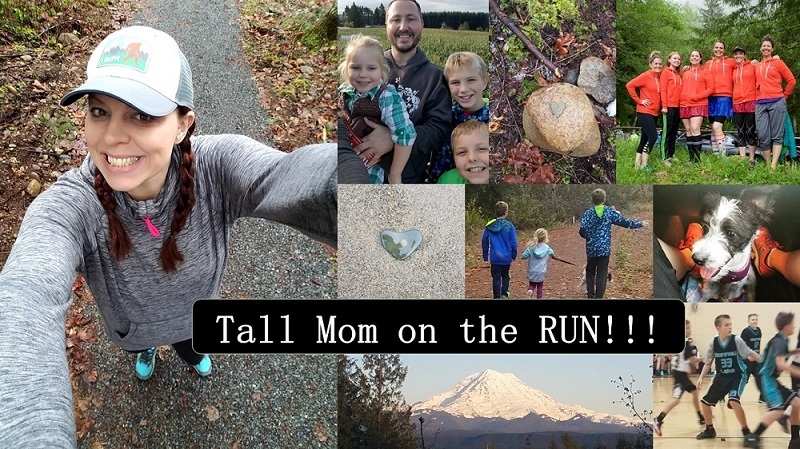 donated to the tall mom marathon for the cure. The gels and foam looks interesting. Linked to this contest on my blog! OK, so the website is sharp. So clean and simple. I love all the yellow and black. And I really want to get the clean foam. very interesting! Just added a link to this on my blog. I try to wear a hat. And if I am not running and it's not unbearable out, I wear long sleeves/pants. I almost always wear sunscreen outdoors, but am really bad about putting it on before a run. I am hit or miss with it. Maybe if I won I would be better about it. I am a 1000+++ member! The Clean Foam is an interesting product - I've never seen a foam sunblock. I try to wear a hat or visor as much as possible because I'm so bad about remembering to apply sunblock before heading out the door! First I learned it's called Scape not ScRape. Good to know. LOL I also learned the face stick can be applied to sweaty/wet skin. Love that! I generally apply 50SPF to me and the kids when we go out in the sun. I should do that more often than I do because I know if it's before 10am I don't. I just never know how to balance them getting their Vitamin D vs. saving them from skin cancer. I am interested in the Facescape as I hate it when sunblock sweats into my eyes. I am religious about wearing sunscreen. I am a 1000 mile member and have donated to the Marathon for the Cure. Just saw your comment on Em's blog about abs of flubber! Funny! oh wait! I was probably supposed to like look at the site, not just the muscles on the first page. I like that they give little charts showing how superior SCAPE is to other brands. I also like the videos that were "the lab"! Pretty cool site and easy to navigate. I like the face stick and spray. These are the ones I would hafve to get! yipEEE! I am a 1,000++++ member!!!! I've gotta say, I love their packaging and marketing! It's interesting that you can apply the face stick to already sweaty skin. Hmm. I'm definitely going to start wearing something when I go out. I like the Clean Foam product. I have had another product with that type of applicator and it is the best. I donated to your Marathon for the Cure for the Virtual 5K. I use lots of aerosol spray sunscreen for hot summer bike rides. Does it say what the active ingredient is? I've emailed them about it, but haven't heard back yet. I prefer mineral based sunscreens, so I'd like to know more. I always wear sunscreen and if I am running, I always have a hat on. I've got extremely pale, sunburn prone skin, so I'm pretty careful. I've donated to the cause. 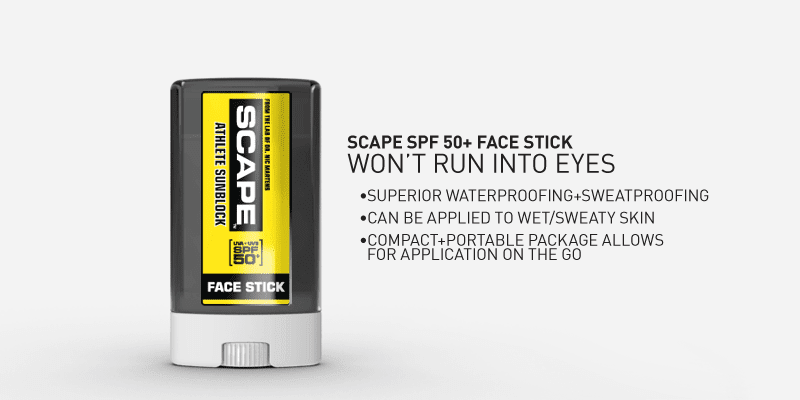 Scape website comments: love the idea of face stick for grown-ups (we have a water babies stick that the whole family uses, but our "baby" is 6 years old now...!). LOVE the idea of no smell, no pore-clogging, noncomedogenic, etc. My face hates most things with SPF so this could be really great for me. The color scheme makes me think they're trying to tap into LiveStrong...the "nearest" dealer to me (I use the term loosely since I live in Maine) is probably at Marathon Sports at the Boston Marathon finish line, where I plan to have my picture taken this July. i love the spray sunscreens, definitely seem easy to use butttt i'd worry that i'm not using enough! I want to try the lipbalm. I have yet to find SPF lipbalm that I am in love with. Never tried a sunblock spray. But I'd be up for that since it seems like it would be easier (and quicker) to apply. I try to remember to use sunblock when I'm outside, but I admit, I'm not the greatest. I try to at least remember to put some on my face (and luckily the moisturizer I use has some SPF in it), but most times I also wear a visor. I'm a 1,000+++ mile club member! Living in Texas, I so need this! 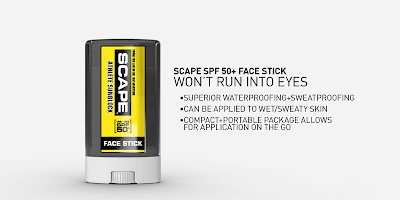 Their website says the Face Stick is portable and can be applied to sweaty skin, which sounds great to me, as I'm so fair that I need to reapply my sunscreen after about 30 minutes in the sun! I protect my skin by wearing sunscreen (sometimes - I need to be more diligent) and a hat. I like that their products are designed for athletes, but I wish the website had less flash. I hate animations and moving stuff on websites. I use sunscreen and UV-protective clothing to protect me when I'm out in the sun. 1,000 club member and donated...does that get me 2 entry's or 1? Maybe you should give me 2? I don't put it on near enough...but if I win I will for sure lather up each time my skin enters the outdoors. I am a sucker for a giveaway! I posted this on my blogroll! I went to their site. I learned that this is a commonly used brand for triatletes because it stays on in all 3 events! What do I do? I am most careful with my face- if I'm running in the sun I use SPF 30 or so and I often wear a visor. For skin protection, I always make sure to wear a moisturizer on my face that has SPF in it. Went to the scape web page and I like the spray, easier to put and not as messy. To protect my skin during runs, I use SPF 50 sweatproof sunscreen that's in spray form. I checked out the Scape site, and I looked how user-friendly it was. I also liked the SPF lip balm. I think I definitely need some SPF 50. I'm a pale, pale lady. I am always seeking the elusive sweat-proof sunscreen, so if it says sweatproof, I pretty much have to try it. i REALLY need this - this tall mom loves the sun. I just looked at the site and Craig Alexander is on it!! Yummy! I run with a hat and that helps with the sun A LOT! I usually try to wear longer sleeves and remember to put on sunscreen, at least SPF 30 or 50, but no matter what, after a 4 mile mid-day bike ride I am toast.